The Victorian Railways constructed 150 new steel GJF grain hoppers at its Newport Workshop in 1972. These hoppers were numbered from GJF 201 to GJF 350 and entered service painted yellow, with a large black 'VR' logo on the side. In 1979 with the introduction of four-letter classifications, the hoppers were reclassified to VHGY 201 to VHGY 350. Later in 1987, the classification was again changed from VHGY to VHGF. These hoppers have seen service in Victoria, South Australia and New South Wales. 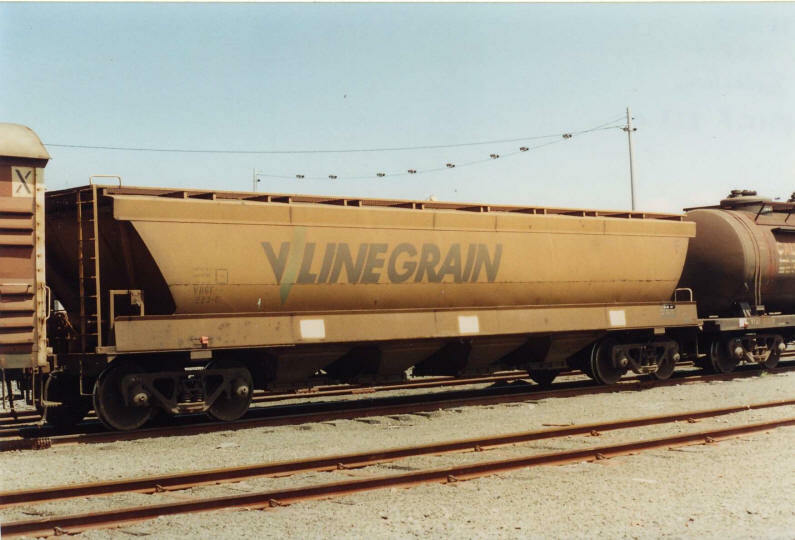 During the 1980's and 1990's, many of these hoppers received the 'V/LINE GRAIN' black and green logos, whilst retaining the yellow bodies. 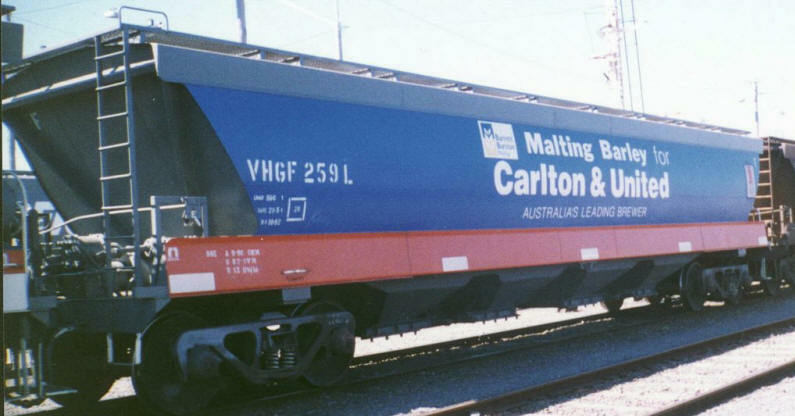 In the mid to late 1990's, a small number of these VHGF wagons were repainted into a unique livery - they were orange and grey on one side with a 'V/LINE GRAIN' white and green logo, and the other side was painted blue with a reference to Carlton and United Breweries. 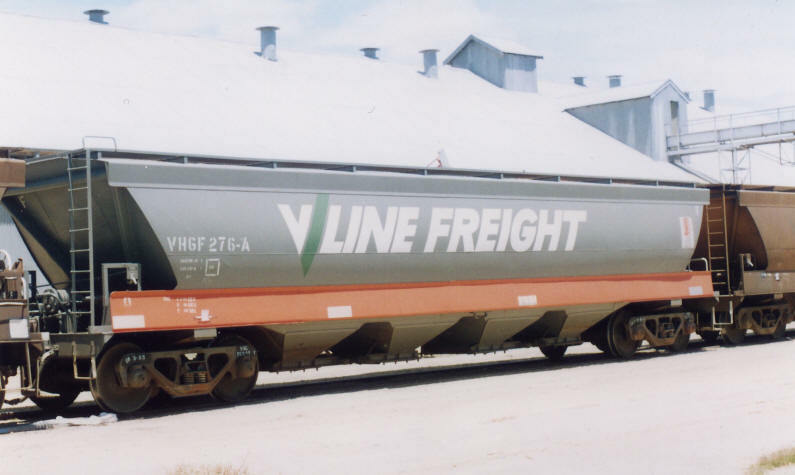 At least one wagon in this build, VHGF 323-J, was painted orange and grey with a 'V/LINE GRAIN' white and green logo on one side, and an ABB logo on the other. lettering, and later a yellow band was added. Some of the green & yellow VHGF's in this number batch also received 'ABB - the grain marketer of choice' lettering. In 2003, a program commenced to convert the manual roof hatches to pneumatic ground operated lids. New roof hatches were fitted as part of this process, together with an additional air reservoir, control boxes, dump valve and pneumatic ram to rotate a new shaft connected to the hatches. With the sale of Freight Australia to Pacific National (PN) in 2004, the PN blue and yellow livery is being progressively applied to the fleet.